Our flexible fabric membrane installed across the opening outside each window or door actually catches and abates the major force of the wind, allowing only about 3% of the wind to penetrate the fabric. In other words, with a 100 MPH wind hitting the fabric dead on, the wind force between the fabric barrier and the opening is a mere 3 MPH, not enough to create anywhere near the sudden pressure change required to lift the roof. Even in the event of a hit by debris and possible glass breakage, which can happen even with hard coverings, there would still be no major pressure change from the outside to the inside that could cause the demise of the roof and structure. 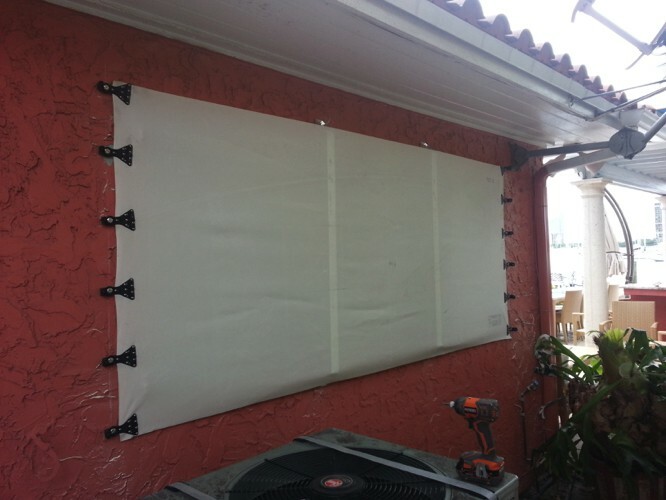 Huge areas may be protected by the one-piece fabric wind abatement system such as large storefronts, lanais and covered sidewalks, and since the system is translucent, while it is deployed business can remain fully open with all the benefits of natural light until right up to the storm. Our team of State Certified Building Contractors is highly experienced installing hurricane fabric. How Can a Fabric Screen Protect the Building? As hurricane force winds strike the side of a building and are redirected over the roof, the wind speed can accelerate by as much as 30% going over the top. This vacuum puts a tremendous upward strain on the roof, much like the lift of an airplane wing. Any sudden positive pressure change created by a window or door blowing in will force the roof to yield to this pressure and fly off, creating the maximum breach of safety for the inhabitants and the ultimate property damage. With the primary structural component of a building gone, the building is declared a total loss and must be rebuilt from the ground up. Unlike hard coverings such as metal or plastic storm panels or plywood coverings which often are pulled off and turned into missiles themselves, the fabric wind abatement system is normally installed as one piece per opening, is very light and almost impossible to dislodge once deployed properly. The patented high modulus clip that has both a spring effect as well as tensile strength. This allows the clip to decelerate objects.